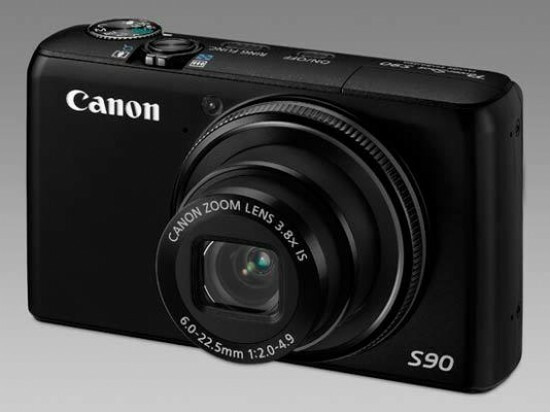 The Canon PowerShot S90 is a new small compact camera with a wealth of professional features. Marking the return of the Canon PowerShot S-series, the Canon S90 is aimed at the DSLR owner looking for a backup compact or the enthusiast who wants DSLR functionality in a pocketable format, with RAW format support, a full range of manual shooting modes and a sophisticated level of customisation on offer. The PowerShot S90 features an intuitive lens Control Ring, which enables users to adjust the settings of various functions by twisting the selector at the base of the lens barrel to the left or right. The S90 shares the same 10 megapixel CCD sensor as the G11, as Canon targets image quality rather than out-and-out resolution. Other key highlights of the Canon S90 include a a 3.0 inch LCD display with a resolution of 461K dots, 3.8x, 28-105mm zoom lens, RAW format support, optical image stabilizer to help combat camera-shake, and a 1cm macro mode. 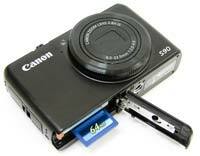 Available in black, the Canon PowerShot S90 is priced at £449.00 / €519.00 / $429.99. Canon's new PowerShot S90 is designed to reinvigorate and re-launch its S-series of compacts. And, with its function attributable lens control ring at the front, solid-feel Ricoh GR III-style build quality, £450 UK asking price, hidden integral flash yet diminutive pocket-sized dimensions, it does command attention from the off. In fact, the S90 feels like a point-and-shoot camera that, to use crass MTV parlance, has been ‘pimped'. So first impressions suggest Canon's breathless billing of this product as ‘the return of the pocket powerhouse' might not in fact be that wide of the mark. Interpreted another way, it's like a bulkier G-series camera - such as the recently reviewed G11 - has been shrunk to more manageable proportions. It feels solid even at its body-only weight of 175g when gripped in the palm - if missing an actual grip - and slips readily into a trouser pocket or handbag. Like the G11, the S90's identically ‘modest' 10-megapixel sensor indicates that Canon is continuing to call a halt to the race for more megapixels in preference to improving said sensor's ability to perform better at higher ISO settings. Thus the S90 offers the ability to shoot at maximum ISO 3200 at full stills resolution, with, more unusually still, a plethora of incremental 1/3 stop adjustments available between the lowest ISO 80 setting and this top option. Canon suggests its f/2.0 lens has been fitted to allow in twice as much light as a more standard issue f/2.8 aperture optic, allowing for faster shutter speeds and shallower depth of field. Other specification of note on the S90 includes a 28mm wide-angle setting, optically stabilized 3.8x zoom providing a four stop advantage claims its manufacturer, 3-inch, 461-dot resolution LCD in the absence of its bigger brother's additional optical viewfinder, side mounted HDMI (High Definition Multimedia Interface) port, plus Digic 4 processor and exposure adjusting iContrast function now a standard feature across the Canon family. More surprisingly for a compact with a width not a great deal broader than your credit card, both Raw and JPEG capture are also offered. Perhaps more predictably, point-and-shoot user friendliness on the S90 comes in the form of the fully automatic face detection, motion detection and Smart Auto scene detection technologies regularly found on Canon's snapshot compacts. Less predictable - and disappointingly so - is that video clips are of bog standard 640x480 pixels resolution rather than the increasingly ubiquitous 1280x720 or 1920x1080: the fabled Full HD. 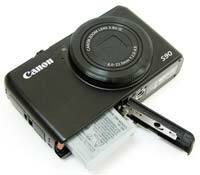 Had Canon included this nigh ubiquitous functionality the little S90 might have had it all - on paper at least. But, pared down to the essentials (which includes a quick start guide in the box and full manual on provided CD only), there's nothing initially about the S90 that feels extraneous or gimmicky. This includes the fact that there isn't a dedicated button for activating the pop up flash, so this is done via selection of the settings offered via the rear command pad/scroll wheel. Select forced flash and, technically, rather than popping up, the bulb instead rises majestically from the body with a low mechanical accompaniment… very cool. The most prominent feature of the S90's clean and rather serious looking faceplate is firstly the lens itself, and secondly the aforementioned control ring that encircles it and turns with a series of satisfyingly audible clicks. Functions are attributed to a twist of the ring in conjunction with a press of the lozenge shaped ‘ring function' button recessed into the camera's top plate. In this way, to take one example, users can elect to adjust focus manually, a distance slider appearing on the right hand side of the LCD screen and the central portion of the image enlarged as a further aid to accuracy. Other options for the ring function are the selection of ISO speed, the tweaking of exposure (+/- 2EV), manual adjustment of white balance or as a stepped zoom, providing the equivalent of 28mm, 35mm, 50mm, 85mm and 105mm steps. And, if you opt for the new ‘nostalgic' mode hidden within the scene mode options, a continual twist of the lens ring in either direction will progressively de-saturate the colours in your image to give the effect of ageing, with a full twist rendering the shot relayed on screen as black and white. Apart from the enticingly tactile draw of the lens ring, the flat front plate of the S90 houses a microphone within a hole the size of a pinprick plus an AF assist/self timer lamp window top left of the lens. The aforementioned flash is housed within the top plate so that when it's raised it is at least a centimeter away from the lens in a cursory attempt to avoid the blight of red eye. Moving to the top plate then we find at its foremost edge a shutter release button encircled by a zoom rocker switch with front lip that has been squared off to fall into line with the width of the body and avoid distracting from the clean lines. There's just enough of it to achieve purchase with a fingertip, lens traveling steadily and surely from maximum wide-angle setting to extreme telephoto in just under two seconds sound-tracked by a low operational whirr. Also set into the top plate is the previously indicated ring function button, plus next to it a smaller identically shaped on/off button. Press this with a fingernail and the S90 powers up for action in just over a second, rear LCD bursting into life soundtracked by a musical ‘sting' and lens barrel extending from its stacked hiding place within the camera's innards to its maximum wide angle setting. A half press of the nearby shutter button and the camera chooses a point of focus within a second or so, AF point or points flashing in green accompanied by an affirmative ‘beep'. Go on to take the shot and there's little if any discernable shutter delay, while full resolution JPEGS are written to inserted (optional) SD or SDHC card (there's no internal memory provided to fall back on) in the standard two to three seconds, with Raw files - selectable in program or one of the other four creative shooting modes - taking a mere fraction of a second longer. With the integral flash housed and hidden to the far left of the top plate (if gazing down on the camera), to the right is an inset shooting mode dial operated by the thumb. Rigid to the touch, it clicks definitely into place at each of its nine mode settings. These comprise the creative grouping of program, shutter priority, aperture priority, manual and a single custom mode, plus separate smart auto, low light, scene and video modes. The low light mode is a new addition to the Canon range, boosting ISO up to an equivalent ISO12800, with the trade off being that resolution drops to a relatively lowly 2.5 megapixels. The S90's smart auto functionality goes ‘one louder' than rivals in comparing common scenes or subjects with not just five or six options, but 22 variables to deliver - in theory - the most appropriate and optimal results. Click the mode wheel around to each subsequent setting and the name and icons of said mode appears on the camera's LCD with, in some cases, a brief text description of the best application for the particular mode. This suggests that the S90 can be used as readily by beginners as more seasoned digital camera users, the variety of shooting options to be found on the mode dial allowing first timers to move beyond their initial comfort zone as familiarity with the camera's workings grows over time. With the back of the compact largely swallowed up by the LCD screen, the visibility of which proves more than adequate both indoors and out (even if larger is nearly always better), a familiar array of controls is found shunted to the right hand side. Familiar, in that they ape those found on the G11 to a fair extent, including the love it or ignore it scroll wheel surrounding the thumb operated four-way control pad. From the top then, we have a rounded piece of moulding extending from below where the mode dial sits on the top plate, a subtle indentation provided into which rests the tip of the users thumb when gripping the camera for shooting handheld. This is the only place on the camera affording much in the way of manually steadying the S90; as mentioned, keeping things resolutely compact, there's no grip provided at the front or sides - being one of the few areas in which this model feels truly compromised. With an indicator light to the left and a built-in speaker to the right of this thumb dip, below we find a pairing of buttons for earmarking images for direct print via a PictBridge enabled device and a dedicated playback/review button respectively. Beneath this again is that control pad and scroll wheel combo. At points north, east, south and west we get options, in capture modes, for adjusting exposure compensation, flash settings, self-timer options, macro or manual focus - if not already using the front lens ring for the latter. If the camera is in playback mode, points north and south allow a series of captured images to be leapfrogged if hunting down a particular shot saved to card in a hurry, or alternatively deleting a duff capture. In the centre of the control pad we find a function/set button. Press this, and as we're used to from recent Canon compacts a toolbar appears down the left hand side of the screen, options highlighted or de-selected dependant on whether the user is in auto capture or one of the more fully featured creative capture modes. In program mode for example, selecting the ISO icon provides a slide rule across the bottom of the screen with ISO speeds set out incrementally in the following order: Auto, 80, 100, 125, 160, 200, 250, 320, 400, 500, 640, 800, 1000, 1250, 1600, 2000, 2500, 3200. The user simply utilizes the scroll wheel or tabs between them to select the desired setting. The other selectable options on the tool bar comprise white balance, Canon's familiar ‘My Colours' effects modes, an exposure or focus bracketing option - whereby three successive shots are taken - the ability to adjust the intensity of the flash, switch between evaluative, centre weighted average or spot metering, single or continuous shooting modes or the various image capture formats - including Raw or JPEG plus a widescreen format option. Returning to the camera back, and below the control pad we find a final pairing of buttons for display and self-explanatory ‘menu'. Press the former once and the user is rewarded with both a nine zone compositional grid and simultaneous histogram being added to the on-screen info. A press of menu meanwhile brings up a trio of folders, for image capture, set up and My Menu settings, in that order. It's via the first folder that the user can enable such settings as iContrast and auto red eye reduction/removal, as well as blink detection and adjusting the image stabilization mode to come into effect only when taking a shot, when panning the camera, or have it on continuously. Here we further find the opportunity to enable the recording of Raw and large JPEG images in tandem - very DSLR-like - when the Raw option is selected from the on-screen side toolbar. While the left hand flank of the S90, viewed from the rear, is devoid of controls, the right hand side features hard plastic covered ports for both an HDMI cable (not supplied in the box) plus more regular combined AV out/USB out port (for which two separate cables are provided). The base of the camera meanwhile features a screw thread for a tripod attachment just left of centre and a sliding door with catch protecting slots for the provided lithium ion rechargeable battery and optional SD/SDHC card, both of which slot relatively easily into place. A battery life lasting 220 shots without flash isn't particular generous however, and any less would be downright alarming at this price point. As it was, after a couple of days' use our battery was back in the provided charger, so you'll want to cart this or a spare battery away with you on any extended trip or visit. So, what can we conclude from the above? Well, the one message that comes across loud and clear is that, for those who have eyed up the likes of Canon's G11 flagship bridge model but concluded that even that was too bulky for their purposes, the S90 offers a more portable - and let's face it, a whole lot cuter - alternative.